A Gal4/UAS–based bidirectional expression system in zebrafish. (A) The Driver construct contains the neuronal zebrafish promoter HuC driving the expression of Gal4-VP16, which binds to the UAS on the Responder construct. Here, it activates the bidirectional expression of hTAU-P301L and DsRed via the minimal promoters. 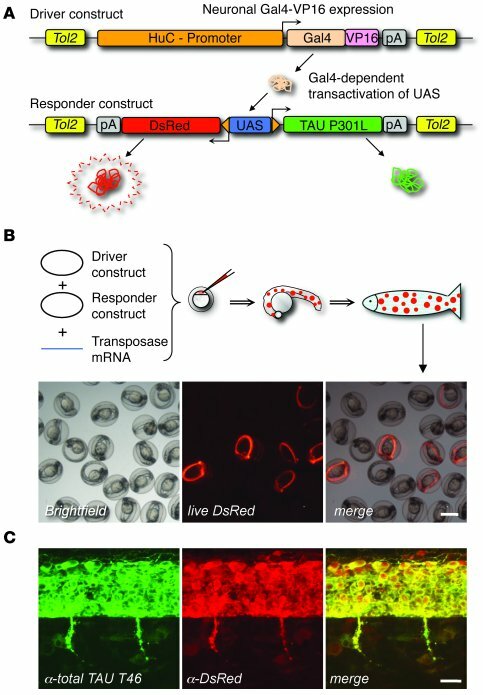 UAS-dependent gene expression of TAU and DsRed is indicated in living fish by DsRed fluorescence. Driver and Responder constructs are flanked by Tol2 transposon sites. (B) To generate transgenic fish, the Driver and Responder constructs were mixed and injected together with Tol2 mRNA. The mRNA is translated to active transposase, which detects the flanking Tol2 elements and catalyzes random integration into the zebrafish genome in a subset of embryonic cells for a short time period, generating mosaic founder embryos. Mosaic DsRed-positive larvae were raised and outcrossed with wild-type fish. A subset of the offspring will be transgenic and can be easily identified and sorted by DsRed-positive neurons. Scale bar: 1 mm. (C) Double immunostainings for total TAU (T46 antibody) and DsRed of 32-hpf transgenic zebrafish embryos expressing hTAU-P301L and DsRed. Transgenic embryos express both hTAU-P301L and DsRed in spinal cord neurons, showing effective bidirectional expression from the Responder construct. Lateral views of the trunk above the end of the yolk extension, anterior to the left. Scale bar: 20 μm.